« Disgusted? Try a stronger D-word: Defunded! March 1, 2019 — (Raleigh, NC) Around noon today, the NC State Board of Elections ordered Robeson County Election officials hand over “newly discovered” evidence that implicates high-profile national and local Democrats in a major absentee ballot harvesting operation that dwarfs the number of ballots involved in Bladen County. Exhibit 66 purported to be the only recorded names of people dropping off completed absentee ballot request forms at Robeson County’s BOE. The forms are not yet required by state law, but SBOE Director Kim Strach ordered some counties to begin logging the names of people dropping off the requests after (then) Robeson County BOE Chairman, Steve Stone alerted the SBOE of a suspected ballot-harvesting operation, involving DCCC personnel. According to the December 7, 2018, Charlotte Observer, “an operative from the Democratic Congressional Campaign Committee dropped off one box of requests on Oct. 8 and another on Oct. 10, totaling 603 voter registration or absentee ballot request forms.” Last summer, according to Stone, the DCCC operative dropped off a business card that was forwarded to Strach’s office. Last week, the SBOE staff only presented evidence to the Board of 231 Robeson County ballot requests, all from Jennifer Boyd, a Dowless employee. The Board was considering a protest filed by Robeson judicial candidate, Jack Moody, after he had won on Election Day but narrowly lost after more absentee ballots were counted. The span of the Robeson request log only covered 17 days in September, while the Bladen County version (Exhibit 4.2.3.1.1) spanned activity from Aug 17 to Oct 30, and reported 1,341 ballots. It also listed the name of each individual participating in the ballot harvesting enterprise. 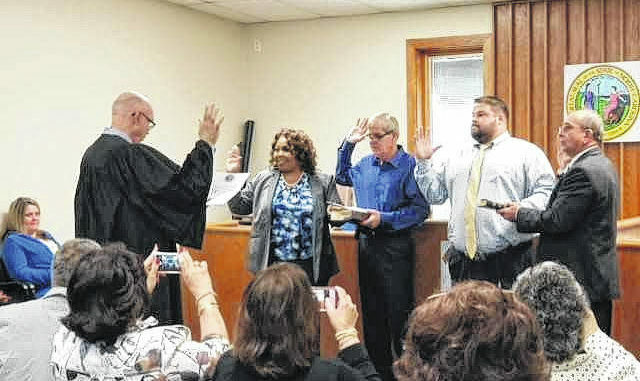 Judge Herbert Richardson gives the oath of office on Monday to the four members of the Board of Elections, Tiffany Peguise-Powers, left, Steve Stone, Daniel Locklear and new member, Larry Townsend. After hastily departing the meeting, DeLancy notified Steve Stone, who was able to secure copies of the original documents, which brings us to today. We received reports that the current Robeson BOE Chair, (and heavy donor to the McCready campaign) Tiffany Peguise-Powers, “raised hell” with the staff for leaking the suppressed evidence. Then somebody tipped off the SBOE. Late this afternoon, VIP received information that the SBOE ordered copies of the leaked treasure trove sometime around noon. The State Board is scheduled to vote Monday, on Moody’s petition for a new election.